I'm standing in my little kitchen, blogging this amidst a pile of gluten free flour bags, cobnuts in 3 states - shelled, unshelled and heaps of the cracked and rejected shell as well as little plates of scones, plums and the general clutter of a day's work. I took a break in the middle of my working day to try out a savoury idea. Taking the concept from a David Lebovitz recipe here, I attempted to bake a gluten free version of those little savoury choux pastry balls - gougère bites. Choux pastry seemed a completely unachievable gluten free concoction but believe me, it is simple - you just need a strong arm to beat the mix and rudimentary piping or spooning skills. So with a glass of wine and a little pile of these savoury gems, let me share the recipe. Please do try them, it is such a joy to eat something so light and delicious AND gluten free! 1. Sieve the cornflour and xanthan gum together. 2. Melt butter with liquid ingredients, salt and pepper in heavy bottomed saucepan. 3. Once butter has melted, tip all flour into pan in one go - take pan off the heat and beat until the flour is combined with the liquids. This will take some doing - and the mix may end up in large lumps rather than in one clump, but that is ok.
4. Put the pan back over a very low heat, immediately add the egg - a little at a time - beating again each time unti lthe egg is combined. 5. As soon as all the beaten egg has been mixed into the batter, sprinkle on 2/3 of the cheese and mix in thoroughly. 6. If you have a piping bag, spoon the mixture in to a bag with a 1.5cm plain nozzle and pipe the dough into cherry sized balls. If you don't have a piping bag you can use a thick freezer bag cutting a 1cm hole across one corner to pipe through. Alternatively use 2 wet teaspoons and form little balls on a lined baking sheet. 7. Sprinkle the finished balls with the remaining cheese and place in the oven for 10 mins. 8. After 10 mins turn the oven down to 190°C and bake for a further 10 mins. At the end of the baking time, take the tray out of the oven and pierce each puff with the tip of a sharp knife then return to the oven for a further 5 minutes. 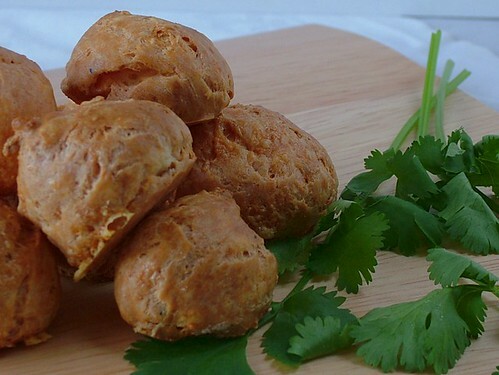 Serve the puffs warm - either fresh from the oven or gently reheated - preferably with a glass of wine and friends! 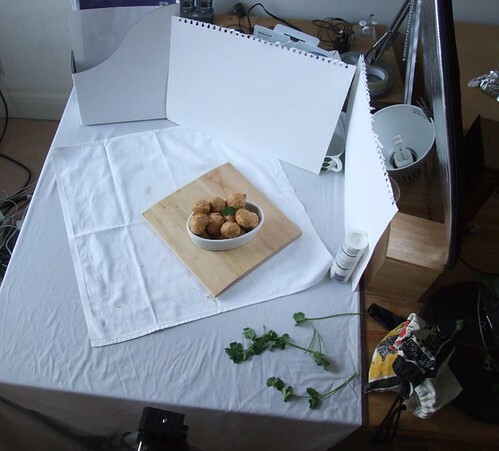 For anyone who has been following the photography steep learning curve - this is the set up that I took the photo above with. A huge development on the photos I was taking 3 days ago! I love your little studio. Not sure I could be bothered to set that up, my dinner would be cold by the time I got to eat it lol! Hah - I am becoming v familiar with cold dinners! I tend to split the recipe and cook in 2 batches. The first half gives a final test for the recipe and provides product for photos. If all goes ok I can just eat the 2nd batch. But if I need it (and I usually do! ), I have the other half to provide extra photography models or to make any tweaks to the recipe. All PR is good PR? dim sum, gluten free, yum!